So let me guess, you found this page because your house was sprayed recently and the room is…well…steaming like a sauna! And they will tell you nothing but lies, such as “it needs to dry out, ventilate, ventilate”. The spray foam industry is one of the most malicious beasts out there. I guess that’s because there is simply too much profit to be made from people, like I used to be, who are clueless about what spray foam is really about. Well you’ll be interested in reading this before you go ahead (and correctly) scrape it all down again. 86% RH at 27 degrees Celsius (82 F)!! This is steaming literally! It turns out the RH was climbing up to over 90% in the day and then magically in the night it would return to normal, around 50% RH. Puzzled by this phenomenon, I narrowed it down to a simple cause: It’s the spray foam itself that acts like a “moisture battery”. Kind of how wood stores moisture and “exhales” it when it gets hot. Sure the wood in the roof deck does this as well, so I went one step further to isolate my experimental variables. 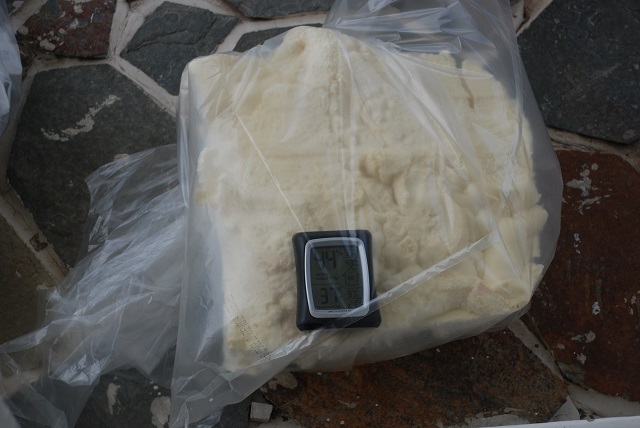 To prove the point, I took a piece of Icynene open cell spray foam, about one cubic foot and placed it inside a clear plastic bag with the thermometer in it. As you can see, in the morning the piece is 24C and 53% RH (that’s dew point 13C), just as the surrounding air in the room was at that point. 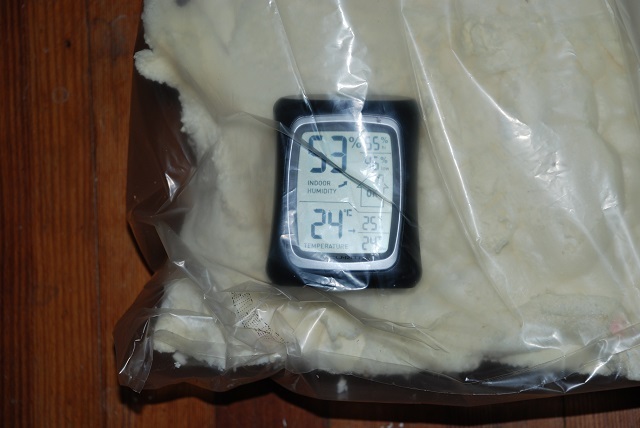 Then we take the bag and place it well sealed outdoors in the warm to heat up. Now the temperature increased to 37C and the RH is 44%. If you do the math, the results are crystal clear: the dew point went from 13C to 24C! Hence, the air in the bag now contains much more moisture than before. I then took the bag back inside and let it cool off without opening it. As expected the thermometer returned to 24C and around 50% RH. This is simple and clear evidence that open cell spray foam (in this case Icynene, but that doesn’t matter) retains moisture and dumps it out when it gets hot (such as when the foam is installed under the roof deck). 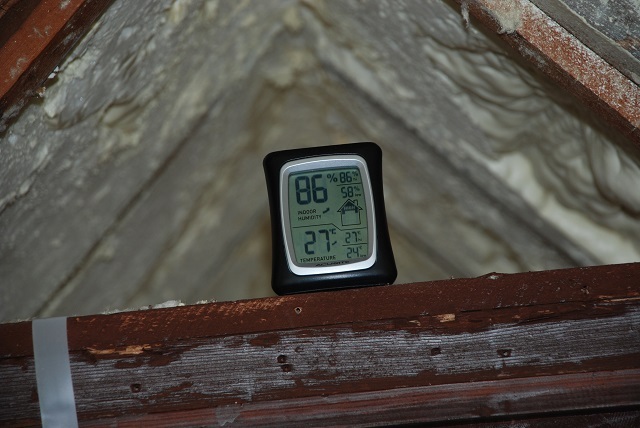 Now you know why your cathedral ceiling is steaming in the summer! They will tell you the foam is hydrophobic, that’s a great fantasy of theirs. The foam absorbs water like a sponge and, as this experiment clearly proves, stores water vapor similar to wood and other building materials. Problem is: you’ve got way too much foam inside a room. It’s not moisture from the room or the house. It’s not a roof leak. It’s not a lack of ventilation. It’s very simple: it’s the foam. And you’ve got a lot of it. After removing the foam under the roof we ended up with a garage full of foam (full in all three dimensions)! Imagine how much vapor is retained in this foam going in and out day and night. This is not a product you would want installed under a roof where the foam itself isn’t vented to the outside. The ability to store vapor naturally implies that vapor goes right through it. Hence, if you put this open cell foam under the roof then winter moisture will move up, hit the frozen roof deck, and condensate. The foam will then absorb the liquid up to a certain point until it can’t anymore. But even if there isn’t enough condensation to make the foam sag, the amount of moisture it stores can cause serious decay to the roof system. Instead of keeping this junk I ended up removing it by hand and installed closed foam (XPS board insulation). Now years and many hot and humid summers later and I can confirm without a doubt, XPS works very well, doesn’t cost and arm and a leg, you can dot it yourself, and above all, it doesn’t stink.